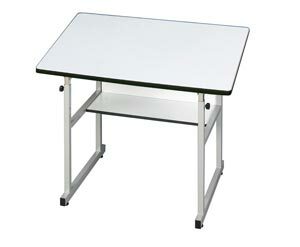 A sturdy, 4-post steel table that is perfect for art, hobby, crafts, graphic arts, and all kinds of creative work in the home, dorm, studio, or office. Built tough to provide years of service, the MiniMaster comes with a durable, rounded corner tabletop and an easy-to-adjust height mechanism with 1" increments. WARNING: This product contains Di(2-ethylhexyl)phthalate (DEHP), known to the State of California to cause cancer. For more information, go to - www.P65Warnings.ca.gov.